“The LORD said to Moses, “Say to the Israelites: ‘On the first day of the seventh month you are to have a day of sabbath rest, a sacred assembly commemorated with trumpet blasts. Do no regular work, but present a food offering to the LORD” (Leviticus 23:23-25). The Feast of Trumpets begins the fall Feasts of the LORD. Unlike the spring festivals, the fall ‘’appointed time’s’ have yet to be fulfilled by Yeshua. In Hebrew, Feast of Trumpets is Yom Teruah. Yom means ‘day’ and teruah means ‘blowing.’ A smaller word within teruah is ruach and means ‘breath of God’ signifying God’s Spirit. Yom Teruah is a day of blowing trumpets that sends the Spirit of God around the world. “Blow the shofar on the concealed, hidden moon on the festival day…” (Psalm 81:3, Hebrew translation). Yom Teruah begins ‘the first day of the seventh month’ and is a New Moon festival. This means that until the new moon is sighted, the festival cannot begin. When there was a ruling body in Israel, known as the Sanhedrin, a visual sighting of the new dark moon was done by two witnesses. The high priest would then have the shofar sounded to establish the beginning of the New Moon feast day. Until that moment, ‘no one knew the day or the hour’ that Yom Teruah began. Yeshua used the same terminology in Matthew 24:36 when he told his disciples about the timing of His return: “No one knows the day or the hour except my Father in heaven.” As a Jewish man, Yeshua understood that ‘no one knows the day or the hour’ to be an idiom for Yom Teruah like we understand the Fourth of July as Independence Day. While living in the flesh as a son of man, he could not know the year for the prophetic fulfillment of Yom Teruah, but he did know in what season and day it would occur. Paul did too. Paul wrote these words to non-Jewish believers in Messiah who had been taught God’s appointed seasons, the mo’edim. They would also have been taught the imagery of a bridegroom coming for his bride. For those believers who were unaware of the ‘’appointed time’s’, who were in darkness and not walking in the light of Torah, the Messiah’s return would be like a thief in the night. “Now, brothers and sisters, about times and dates we do not need to write to you, for you know very well that the day of the Lord will come like a thief in the night” (1 Thessalonians 5:1). There are two types of trumpets blown at Yom Teruah. The first are trumpets made of hammered silver that God commanded Israel to make in Numbers 10. The priests blew these two trumpets on numerous occasions: when they were assembling the community and setting out from their camps in the wilderness, when they went into battle so that the LORD would remember them and rescue them, when they had burnt offerings and fellowship offerings, and when they rejoiced at the ‘’appointed time’s’ like the New Moon festival of Yom Teruah. The other trumpet is the shofar. A shofar is made from a ram’s horn or any other clean animal such as a goat, antelope, kudu, or gazelle. This type of horn is mentioned 69 times in the Hebrew Scriptures and was symbolic of the ram that was caught in the thicket when Abraham was going to sacrifice Isaac. There are many resources on the internet where shofars can be purchased. There are small and medium sized ones that come from rams and goats known as a ram’s horn. Extra long ones with one or two twists come from an African kudu and are called yeminite shofars. 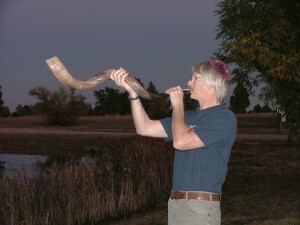 One way to experience the joy and celebration of ‘the day of blowing’ is to blow a shofar. Though Scripture doesn’t indicate what sound patterns were made, over the millennia the rabbis came up with four that are blown in a certain order. These are the sounds most likely used when Yeshua lived in Israel and Paul also used these different terms when he writes his letter to the Thessalonians. These traditional sounds are still used today when celebrating the day of blowing. “Praise him with a blast on the shofar! Praise him with lute and lyre!” (Psalm 150:3). The tekiah means to ‘blow or to blast’ and is a call to worship. This blast gathers Israel and those who join with them around the world to celebrate the Feast of Trumpets. The blast is medium length with a low to high pitch transition. It starts with a hard, short push on low pitch and a slight sustain on high pitch and ends with a short higher pitched burst. It is considered by many as the blast to praise the LORD’s creative acts as well as for the coronation of a King. “Then David danced and spun around with abandon before the LORD, wearing a linen ritual vest. So David and all the house of Israel brought up the ark of the LORD with shouting and the sound of the shofar” (2 Samuel 6:14-16). “Shout out loud! Don’t hold back! Raise your voice like a shofar! Proclaim to my people what rebels they are to the house of Jacob their sins” (Isaiah 58:1). The second blast of the shofar, the shevarim, means ‘broken’ and is the call to repentance. This blast reaches into men’s souls to convict them to turn back to God with a broken and penitent heart. It consists of three blasts each low-to-high pitch making a wave-like sound. “Put the shofar to your lips! Like a vulture [he swoops down] on the house of the LORD, because they have violated my covenant and sinned intentionally against my Torah” (Hosea 8:1). “Blow the shofar in Tziyon! Sound an alarm on my holy mountain!” Let all living in the land tremble, for the Day of the LORD is coming! It’s upon us!” (Joel 2:1). The third blast is the teruah and means ‘blowing’ as in Yom Teruah. This blast is a battle alarm and is made with nine short one-second staccato bursts of sound. This is the sound that Jeremiah heard as the Assyrians began their attack against Jerusalem. It will be the sound that begins the judgment Day of the LORD. “My guts! My guts! I’m writhing in pain! My heart! It beats wildly — I can’t stay still! — because I have heard the shofar sound; it’s the call to war” (Jeremiah 4:19). “But your dead will live; their bodies will rise. You who dwell in the dust, wake up and shout for joy. Your dew is like the dew of the morning; the earth will give birth to her dead” (Isaiah 26:19). The final blast is called the tekiah gadolah and is the long great blast known in Scripture as The Great Shofar. It is similar to the tekiah except that the high note is sustained for the longest possible breath. It also ends with a violent, short, pushed out breath and an even higher-pitched note. This is the blast of hope prophesied by Isaiah that will raise the dead from the dust of the earth. “Who is a God like you, who pardons sin and forgives the transgression of the remnant of his inheritance? You do not stay angry forever but delight to show mercy. You will again have compassion on us; you will tread our sins underfoot and hurl all our iniquities into the depths of the sea” (Micah 7:19). Tashlich comes from the Hebrew word meaning ‘to cast.’ After the Temple in Jerusalem was destroyed and there could be no atonement for Israel on Yom Kippur, a tradition of ‘casting stones’ was created. The traditional ceremony involved filling your pockets with small pebbles or stones and ‘casting’ them into a body of water. The body of water was to be ‘living water’ or a place where fish were able to live. To celebrate tashlich, stones are gathered representing the sins that individuals have committed either willfully or unknowingly. They can be little pebbles or larger rocks depending on the situation and the personal view of that sin against God. The gathered stones are then placed into the person’s pockets to remind them that sin hinders and becomes a burden in our lives when it remains unconfessed. As each stone is taken from the pocket and thrown into the water, it is symbolic of not only confessing those sins, but also repenting from those sins. Some people yell out their sins while others remain contemplative. Tashlich is a fun and memorable way to act out Yeshua’s atonement for sin with God hurling all of our iniquities and sins into the bottom of the sea. It is also holds the powerful reminder that like the stone which remains in the bottom of the sea, our sins do not float back to the top and return to us. They remain ‘cast away’ forever. “For if you forgive other people when they sin against you, your heavenly Father will also for give you. But if you do not forgive others their sins, your Father will not forgive your sins” (Matthew 6:14). Tashlich is more than just a time for us to repent to God for our sins and turn back to Him, it is also a time for us to forgive one another. Yeshua says that we are to forgive a brother (or sister) seventy times seven. It is up to us to forgive those who have offended us whether its 490 times or 490,000 times. It is important to live with a clear conscience with our family, friends and acquaintances. As stones are thrown into the water, we can ‘cast away’ all offenses that may have been committed against us so we can live in peace with each other as well as God. “…Because his mercy toward those who fear him is as far above earth as heaven. He has removed our sins from us as far as the east is from the west. Just as a father has compassion on his children, the LORD has compassion on those who fear him” (Psalm 103:11-13). “‘In the seventh month, on the first day of the month, you are to have a holy convocation; do not do any kind of ordinary work; it is a day of blowing the shofar for you” (Numbers 29:1). As commanded in Scripture, the Feast of Trumpets is a day of blowing the shofar; however God gives no reason for doing it. Perhaps through this annual blowing of the shofar, God’s people learn to recognize the sounds preparing them for an event that has not yet happened. “Listen, I tell you a mystery: We will not all sleep, but we will all be changed— in a flash, in the twinkling of an eye, at the last trumpet. For the trumpet will sound, the dead will be raised imperishable, and we will be changed. For the perishable must clothe itself with the imperishable, and the mortal with immortality. When the perishable has been clothed with the imperishable, and the mortal with immortality, then the saying that is written will come true: “Death has been swallowed up in victory” (1 Corinthians 15:51-54). Paul describes the trumpet blast of God as a Teruah Gadolah. On Yom Teruah the eternal hope of everyone from Adam to Abraham to the Prophets and Israel to the redeemed Body of Messiah will become reality. When this shofar blast is sounded, the dead in Messiah will rise and those who are living will be changed from mortal into immortality and live with Yeshua forever. “For the Lord himself will come down from heaven with a loud command, teruah gadolah with the voice of the archangel and with the trumpet call of God, and the dead in Messiah will rise first. After that, we who are still alive and are left will be caught up with them in the clouds to meet the Lord in the air. And so we will be with Yeshua forever” (1 Thessalonians 4:15-16). There are no New Testament accounts of Yeshua celebrating the Feast of Trumpets. Though he was revealed as the Messiah of Israel, he still remains ‘concealed’ in the heavenly realm just like the new moon until his next ‘’appointed time’’ arrives. Until that ‘unknown day and hour’ comes, Israel and those joined to her are commanded to gather once a year to blow the shofar and prepare for a mysterious event. When the Spirit of God blows the Great Shofar on the Day of the Lord, the concealed mystery of Yom Teruah will be revealed.